1003 copies of Athlon's Vanderbilt custom cover, and still going...thanks to everyone who bought a copy as to prevent me from receiving a UT cover in June. If you didn't buy one, you still should, or at least have to suffer with the guilt of knowing you could have let all of Commodore Nation down. Read Stan's comment, and then watch this. And in sports news today...............oh no. "Steven Jackson Steve--...................................Reggie Miller's looking good..............He shoots the three--and it's good!.....................Later he gets the rebound, passes it to the man, shoots it!--"
they now have a much better cover, in my opinion, without the awkward picture of earl hunched over. 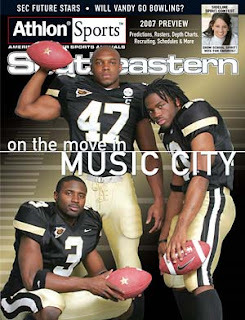 either way, happy that vandy made the cover.